Your WordPress site may have some plug-ins; additional code to set up forms, link to social media and collect statistics. Some or all of these may include Cookies. How do I know what Cookies are on my site? Do I need a Cookie consent box or disclaimer? If you are confident a visitor to your site will not result in a Cookie on their machine, you do not need to tell them or ask for their consent. Some of the simplest websites, that do not analyse traffic or offer links to social media, may not be using Cookies. GDPR what data do you really need on website forms? The GDPR (General Data Protection Regulation) comes into force on 25 May 2018 and has implications for a website that collects any personal data as part of its contact process. If your website has a contact form, or options to sign up for newsletters you will be collecting personal information. What you need to ask yourself is what information are you collecting, why are you collecting it and how will you store it securely? Usually ask for name and email; they may also ask for a phone number and most usually have a space to give a subject and some detail of why you are contacting the business. The personal information is name, email and phone number. Under GDPR the legal basis for your business processing the personal information supplied by the contact form is to respond. All the individual has consented to is your business responding to their request. Unless specified on the contact form, they have not agreed to be added to your marketing or newsletter lists or to have their details passed onto other organisations. We recommend adding in an extra checkbox to collect consent ‘I am happy to receive news updates and promotions / special offers’, with an extra line to reassure website visitors that you will not share their details with any third parties. Your website might offer sign up for updates and newsletters. If someone chooses to signup they have given consent. What you need to do is ensure you only collect and process personal data necessary to deliver the updates and newsletters to that person. Ask yourself what channels do you use for marketing? If you only send email newsletters, why ask for phone number or postal address? This additional personal information is not required to send an email newsletter. If you like to personalise newsletters, you may want to collect a first and last name as well as email address, and it is important to make that clear on the sign-up form. Would you like a Retweet? Twitter is a fast paced platform, with over 100 million users who login on a daily basis, writing and producing the right content is important. The key to effective engagement on Twitter is to be reactive, more so than any other of the Social Media platforms. It is important not to simply schedule Tweets that just involve selling your products and services but to produce content where you audience will be interested in what you have to say. This will then increase your chances of getting a re-tweet or a few likes, thus spreading the word about your business. 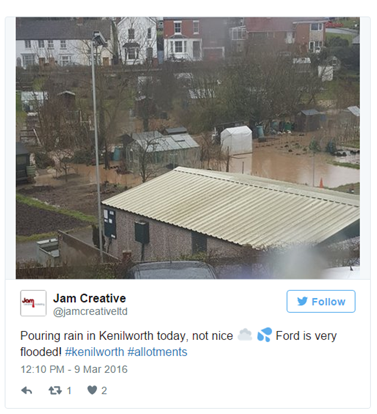 We recently tweeted about the awful weather in early March 2016 when heavy rain saw some roads in the town flooded. This was then picked up by the Kenilworth Weekly News and was included in one of their articles. It is important to remember not to post for the sake of it, but instead develop quality content which engages your audience. Results may take time, but you will build a quality following and develop a valuable relationship with your followers. We were privileged to have The Right Honourable Jeremy Wright MP visit us on Friday 5th February 2016 to wish Kenilworth House a happy first birthday. Alongside The Orange Partnership, Charles Peters Recruitment Specialists and Mobilerecon, we celebrated our first year in the Kenilworth House office with the help of Sally Evans Photography who took our photos. Here is to another successful year in 2016! 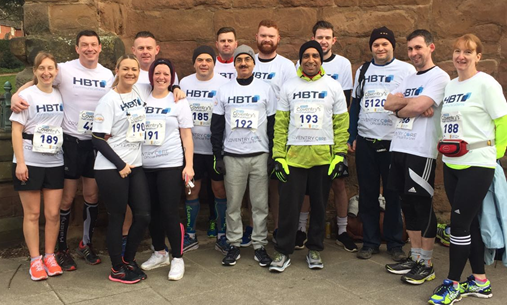 On Sunday 28th February 2016, Jane ran the Coventry Half Marathon alongside one of our clients – HBT Communications. We are pleased to say she successfully completed the 13.1 mile course in under two and a half hours, which was her aim. Her next challenge is to get the rest of her team to do it! So you’re confident in everything your business does, you are the ultimate professional who delivers every project to the highest of standards, yet online you appear mediocre at best. Your website is the first point of contact for your customers and it is therefore imperative that they are confident in what they see. Standing out from the crowd is a vital component for effective online presence. Whether that be through the style of your website, the colour and design or the ability to interact and engage with your audience. It is important that your website is built around the needs of your business. For example, whether your business is in the product or service sector, or whether you are trying to target families or professionals. For instance, if your business is very people focussed, ensure it is clear on your homepage. Have some imagery of your team and the professional service you provide. It was estimated in 2014 that 57% of people used their mobile devices to access and search the internet. Therefore having a website that is responsive – meaning that it will work effectively across multiple devices including computer, mobile and tablets – is crucial. People like reassurance and they will often look at reviews and testimonials when making their decision. Look at the growth and popularity of TripAdvisor and Google Plus. Make sure you have a dedicated page/section of your website where you can showcase your clients and the work you have done for them. Don’t overload visitors to your website with excessive amounts of text with limited imagery. We understand that this will vary depending on the nature of the business, but you want to ensure your site looks professional to showcase your expertise whilst also delivering something memorable.